Have you ever worked on the sharing system or in a group where you thought of having a control on what others do? Well, this can be the situations when you are running your business and want to track your employees like what they are doing, whether those are productive or not. The similar cases can also apply in case of parental control when being a parent you may want to know what your children are doing? Ok, so no matter what is your situation, if you want to know and keep your subordinates safe and productive on the laptop or desktop, you need some kind of monitoring system. Although with some basic features of your operating system you can make a track like what they are browsing through browser history. And what they are opening from the log file but neither those are sufficient and nor a good way to do that. So, the best solution is to use some external software for the same which is master in their segment. One such software that I have come across recently is TheOneSpy and after using it for certain period, I am impressed with the functions and features. In this TheOneSpy review, we are going to talk about the tool in detail with features, uses, and pricing. TheOneSpy is an advanced spy app for mobile phones, tablets, and computer (both windows and mac). It helps you monitor the activity logged on the device where the tool is installed and get you the details in real-time. There are varieties of features of the software which we will discuss in the coming section which you can use to best utilize the tool. TheOneSpy software is a quality product by the parent company Ox-I-Gen which is based out of Sydney, Australia and provide solution globally. Now as we know what is TheOneSpy and the details about it, let’s see how to get started with the TheOneSpy software to monitor the windows and Mac operating system. How to get started with the TheOneSpy Software? This step is pretty similar to what we do for any other software. First of all, you’ll have to download the software for your respective operating system and then install on the device which you want to monitor. As you can see currently the three devices are being monitored using the TheOneSpy tool. Now if you want to see the details of any specific system, you can click the dashboard button and it will show you the health of that server or system. As you can see this dashboard is for a dedicated system which shows the complete details of the server or computer. At the left side, you’ll find various icons and options. This is where you will find the spy details. Like you can check the browser history. Similarly, you can record the screen of any or all system connected and see what exactly those are doing. Similarly, there are loads of options available which we are going to discuss in the next TheOneSpy Features sections. These features apply to both the operating system and you should know these in order to make the best use of it. I am keeping this at #1 because being an employer you might be interested to get the summary of what your subordinates are doing. If you’ll find something wrong, you can further dig into it. TheOneSpy provides some of the bets reporting it can be. The visuals are appealing and clearly shows the insight. You can take the screenshots and save it for further use of any device connected. This is not only helpful in spying but also helps to increase the productivity. This feature is on-demand and will be stored on the TheOneSpy server. You can check as and when you want from your dashboard. This is the most common feature and you must have come across as well. You can block certain kind of websites from being accessed. This can be done from the TheOneSpy dashboard. This will not only help your employees to save time but also to keep safe & secure. After all, we are doing all these to increase the productivity…right? There are few more by the company. It helps you develop, setup, and notify the task to the employees. By this way, they won’t be able to miss anything and there won’t be any loss. The pricing depends on which tool you are buying. For windows operating system the price starts at $20 per month. 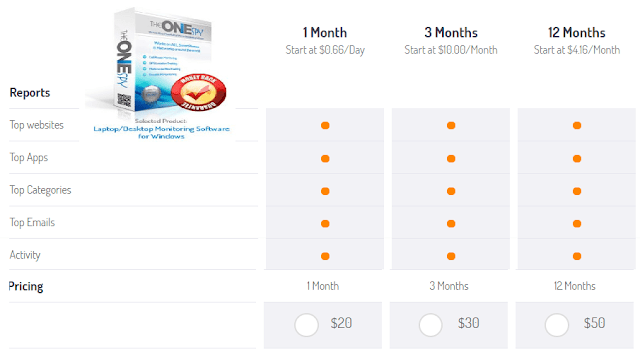 And for each software, three pricing plans are available which consists of 3 licenses. For Mac users, the price starts at $25 per month. Depending on the operating system and platform you are using, you can subscribe to that pricing. For all the products, 3 plans are available and each consists of 3 licenses. This was all about the TheOneSpy review. Hope you got the clear idea of how to monitor your windows and Mac system using the TheOneSpy software. I found it an excellent tool for all kind of device monitoring but you are recommended to use it legally. If you have used any similar software for computer and mac monitoring, please share those with us as well.